Grouper comes in numerous varieties, colors and sizes. Like most fish, grouper contains large amounts of protein, minimal amounts of saturated fat and no sugar. Unlike fatty cold-water fish, grouper does not supply large amounts of healthy omega-3 fatty acids. Grouper can also carry a toxin, ciguatera, which can cause neurological problems if you ingest it. Most fish, including grouper, are naturally low in calories. A 3-ounce raw serving of grouper supplies 100 calories. This equals just 5 percent of your daily calorie intake if you consume an average 2,000-calorie diet. One cooked fillet contains 240 calories. Because of its low calorie content, grouper makes an excellent food choice when you’re watching your caloric intake. Protein is essential for repairing damaged body parts and building new tissue. Fish serves as an abundant source of protein. Grouper contains 16.5 grams of protein in a 3-ounce cooked serving of fish, which equates to just over 25 percent of your daily recommended intake of 50 grams of protein per day. One fillet contains 50 grams of protein, or 100 percent of your protein needs. Grouper does not contain any carbohydrate. Grouper does contain some fat, mostly unsaturated fat. Grouper contains a small amount of the omega-3 fatty acids DHA and EPA, although not nearly as much as fish such as salmon, mackerel or herring, according to the Minnesota Sea Grant. 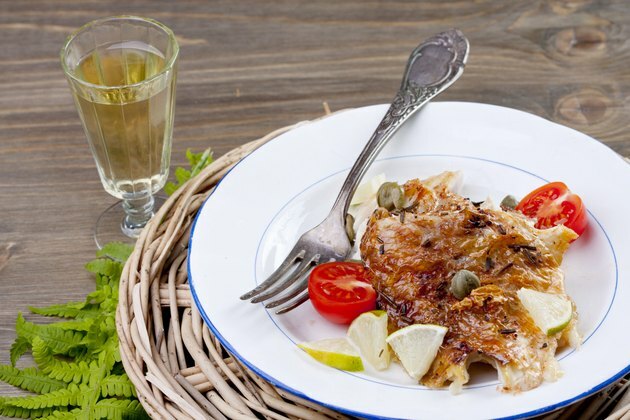 Grouper, like other fish, serves as an excellent source of some vitamins and minerals and also contains low amounts of minerals such as sodium. A serving of one fillet supplies 25 percent your vitamin D needs, 15 percent of your iron, 20 percent of your magnesium and small amounts of the B-complex vitamins. A cooked fillet also contains 8 percent of your zinc and vitamin A needs.